The International Space Station may help researchers evaluate self-guided tools meant to aid astronauts in enduring taxing, anxiety-filled, long-duration space voyages. 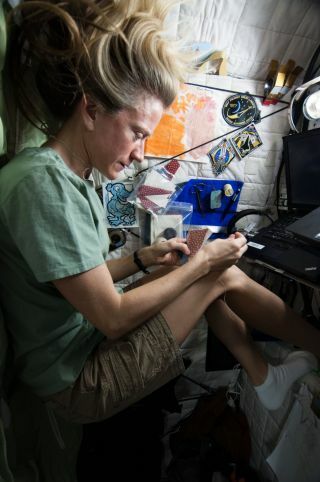 Here, NASA's Karen Nyberg, an Expedition 36 flight engineer, uses some of her off-duty time on the station for sewing, one of her many hobbies. Depression and other emotional problems can be severe enough on Earth, particularly during the holidays, when the "holiday blues" leave many feeling gloomy and helpless. But imagine yourself on a taxing, anxiety-filled, long-duration space voyage. How would you cope there? Astronauts on a deep-space mission will be much too far removed to make an office call to a specialist who could help handle depression and other psychosocial issues. In space, such maladies can pose a substantial threat to crew safety and mission operations. James Cartreine, a licensed clinical psychologist and a researcher in the Brigham and Women's Hospital’s (BWH) Program on Behavioral Informatics and eHealth, also produces interactive media and videos. (BWH is an affiliate of Harvard Medical School.) That melding of psychology and media led the researcher to create a suite of interactive media programs to help astronauts manage the pressure-cooker environment of lengthy space travel. Interactive "modules" of treatment, self-assessment, training and resources could deliver mental health care to crews on board the International Space Station. "We've interviewed astronauts who have flown long-duration missions from different eras of spaceflight," Cartreine told Space.com. "The interviews were about what kind of tools would be useful and how could those tools best be structured in order to make them most useful, most usable most acceptable," he said. Whether on Earth or in space, the experience of depression is similar, Cartreine said. But in space, the opportunities to take action can be more limited. "All that creates a huge amount of stress," Cartreine said. "We've had lots of input from astronauts, and the focus of this work is to design tools for their use … to develop a program that delivers high-quality, evidence-based treatment. So we've done that for depression, interpersonal conflict and for managing chronic stress." Since 2001, Cartreine and colleagues have been working on the idea of a computer program delivering high-quality treatment in the absence of a counselor or a therapist. The National Space Biomedical Research Institute (NSBRI) supported this research through a NASA cooperative agreement. The work addressed risks managed by the Behavioral Health and Performance Element within NASA's Human Research Program (HRP). "The technology, along with the salient findings of Cartreine's research, is in the process of being transferred to NASA's HRP," said Graham B.I. Scott, vice president and institute associate director of the NSBRI in Houston. "NSBRI is addressing the 'behavioral medicine' risk with a significant portfolio of funded projects," Scott said, "addressing gaps that must be closed to mitigate this serious risk to human spaceflight." Video clips of Mark Hegel, a psychologist at the Geisel School of Medicine at Dartmouth, are part of a suite of interactive media programs to help astronauts endure the rigors of lengthy space travel. Cartreine's team has produced a set of interactive media programs and the architecture to put it all together, he said. "We took the approach of designing software that graphically represents where the person is living and working, which is the International Space Station," he said. Via a kind of 3D graphic interface, called a "zooming interface," an astronaut can enter "modules" of treatment, self-assessment, training and other resources. It's more of a game-like experience, Cartreine said. The modules make it possible to deliver treatment when no treater available, he said. The depression treatment is part of the Virtual Space Station, a multi-media program that addresses multiple types of potential psychosocial problems. Astronauts can use it for training before a mission, and for assistance during spaceflight. The Virtual Space Station also includes treatments for interpersonal conflict, stress and anxiety. "It's a very user-friendly, intuitive way to connect a lot of different types of content and categorize it in a way that is logical and understandable and appealing … whether the user is an astronaut or somebody else," Cartreine said. One interactive simulation, for example, mimics a quarrel with a fellow space traveler. Dozens of video clips permit a conflicted crewmember to sort through ways of dealing with the conflict. Specialized computer software could help astronauts deal with depression, interpersonal conflict and chronic stress. Despite their roots in spaceflight data, the research results have yet to find their way into space, Cartreine said. "I sure want to see it used," he said. "Ironically, it might go to many other people before it ever goes to the astronauts, as we're in the process of commercializing the depression treatment now … to get it out to the public." Cartreineis currently accelerating his efforts to make the NASA-related computer programs available to people on Earth via his company, Cognitive Behavioral Technologies, LLC. Cartreine said the work may be the first mental health spinoff stemming from NASA research. "I'm thrilled if we could save a mission, save millions of dollars and perhaps even save a life in space. But I'm also very excited if we can get this out to many thousands of users across the country, maybe even around the world," Cartreine said. Leonard David has been reporting on the space industry for more than five decades. He is former director of research for the National Commission on Space and is co-author of Buzz Aldrin's new book "Mission to Mars – My Vision for Space Exploration," published by National Geographic. Follow us @Spacedotcom, Facebook and Google+. Original article on Space.com.